I love Gazpacho and there is not better time to make and eat this yummy cold soup but now when gardens are overflowing with tomatoes. I am always trying new recipes for Gazpacho looking for that perfect one. This one is pretty close. It is a tangy and chunky. The chipotle gives it a nice amount of heat and smokiness. The recipe is from a local restaurant, New City Cafe. Do you have a favorite Gazpacho recipe, post about it and link it up below so we can give it a try! As said Juanita, the real gazpacho is done with yesterday's bread and garlic, but I can add that it hasn't got any cilantro, onion and chipotle pepper, and instead red pepper, is green pepper. I thought you might want to know that pictures of your posts or the full post aren't showing up in google reader for the last few days. Often, I just skip over reading the posts I can't read in the google reader...and I love your site! I thought you might want to know. 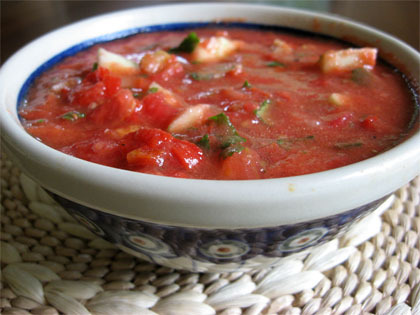 I'm sad to say that I have never tried gazpacho but after this post I NEED to! That's in addition to all the other tomato/vegetable ingredients, of course! "Here in Spain we also put in some pieces of day-old bread, a clove of garlic, a little water and we blend them all together." I've had this "white gazpacho" and it's delicious! Gluten-free white bread works, too. Peel vegetables and blend all ingredients until smooth. Serve as a refreshing drink, as a dip for bread or as a cold soup over chopped boiled eggs, tomatoes, onions and peppers. Yum!!! I HAVE TO TRY IT!!! every summer I make a batch of Gazpacho for my father. This year was no exception. In fact I made two batches. The first one was from the Mayo Clinic. I didn't care for it. The second comes from the Canyon Ranch Cookbook. This is the one I get close to each year. Your recipe is close to what mine consists of . I add Worcester sauce though and some lime juice to the mix.